I have gone nuts recently buying new smart home products including smart home Ecobee thermostats. Almost more than what I can handle for projects in this 2700 square foot house. During the course of this recent buying spree, my wife and I purchased not one, not two, but four Ecobee 3 Lite Thermostats. One for each zone in my house. I figured, if I’m going all in, then I’m going ALL IN! Why Did I Buy Ecobee Thermostats? Primarily I decided to buy these because of an upcoming 8 day trip to Disney in January…..we live in New England…..thermostats have to work or you have frozen pipes and a whole slew of other residual issues. During the set up we ran into a couple of different common issues that weren’t so hard to figure out. After the installation portion, all of the thermostats seemed to run fine for a couple of days with no hitches whatsoever. We even took the time to set them up with our Alexa for voice control. My wife got up and took our daughter to school. Then rushed home and got ready for work. In her hurry, she didn’t notice that the thermostat (which normally is set to 70 degrees by schedule during that part of the day) had somehow cranked itself up a few degrees above the normal temperature and was still climbing. I work from home and pretty much work in my basement a large part of the day. The only two times I go upstairs to do much of anything I am not near any of the thermostats and wouldn’t think to check them. The thermostat in the basement seemed fine, so I guess I figured that nothing was wrong anywhere else. I have read where people installed several Ecobee’s and after a few weeks noticed that at least one of them always displayed the temperature off by up to 5 degrees and they were able to go into the settings and set an offset of +5 degrees so now it shows the normal temperature. 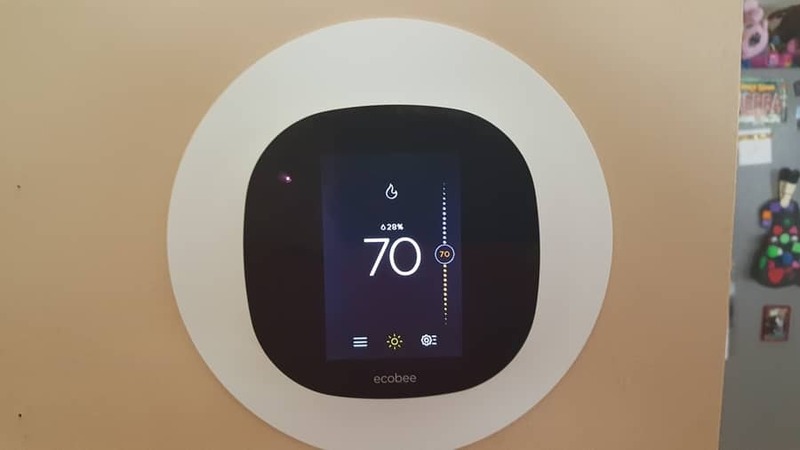 I’ve also read online in the past, before I bought mine, that a few people were having issues with their Ecobee’s getting hot and revealing the temperature as more sweltering than the real temperature. Specifically, Ecobee 3’s which almost made me think twice about the brand. Around 3 PM when my wife arrived home from work she yelled down to me in the basement and said: “WE HAVE A PROBLEM UP HERE”. So, of course, I hightailed it up the stairs as fast as I could to find out what was on fire. The brand new Ecobee thermostat was somehow set to 81 degrees and climbing with no end in sight even though it was still set to 70 degrees. We followed the troubleshooting in the manual and even reset the thermostat twice to original factory settings. I immediately contacted Ecobee technical support and told them what was going on. There are several reasons that we chose to go with Ecobee. One of them is for their outstanding support! The representative I spoke with first asked us for the serial number of the Ecobee unit and looked at the status report to see when the problem started happening, which he could see from his end by connecting to our Ecobee. You can also go to the Ecobee website, and log in to look at your “home iq”. That tracks the temperature in each room and can help you figure out at least when the problem started. We established that it happened right before my wife went to take my daughter to school that morning. Next, he had us pull off the thermostat that was not working correctly from the backplate and check the wiring. Which is extremely easy to do with an Ecobee thermostat. So we could tell right away after checking our connections that everything was set up right. Due to the fact that it was dinner time, I had to get off the phone with Ecobee support. After eating I almost called them back to continue the process. However, instead, I thought about it for a minute and decided to switch the thermostat in the living room with one in my daughters’ playroom and guess what? It worked perfectly fine. This eliminated the idea that our wiring was where the problem was stemming from. So I decided to call Ecobee support back and ask them what steps we needed to take? Our trip to Disney was planned for the coming weekend and it was a Monday. The support representative that we spoke with kindly told me that they could ship me out a replacement and do an RMA. He said that he might be able to get it to me in time. I asked, “don’t you need your broken one back first”? Well, after I picked my jaw up off the floor I hung up the phone. Ecobee told us that they only ship on Monday’s, Wednesday’s and Friday’s. Remember, this was Monday and they were shipping it to my house in New Hampshire from Toronto, Canada. I received the new one inbox on Thursday! That means they basically over-nighted it so that it would be here in time for us to go on vacation with the comfort of being able to see what the temperature was at our house. I’m simply amazed by Ecobee’s customer service and generally speaking the quality of the product is amazing. Sometimes it isn’t all about what you didn’t do right. Sometimes it is actually a defunct product and if the company is willing to own up to it and take good care of the customer as Ecobee did, then they wind up getting a good review like this. If you would like to check the current pricing for Ecobee Thermostats you can find them over here on Amazon. Am I saying that Ecobee makes the best smart thermostat? Maybe, maybe not, but it was definitely worth the money in my opinion just to get that kind of customer support on the back end. To me, that is priceless.